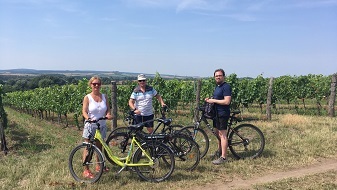 Private wine tasting bike trip in Mikulov wine sub-region. Mikulov town, with its beautiful Baroque castle, is the most picturesque town found in the South Moravia. Besides the historical monuments, the town`s mediterranean atmosphere is underline with surrounding limestone ridges on which grow the best vineyards in the Czech Republic. For those who love good wine, biking, history and wine tasting in the vineyards and those who want to learn about the Czech vinegrowing, we have prepared in cooperation with the local winegrowers a customized Wine Tasting Bike Trip. 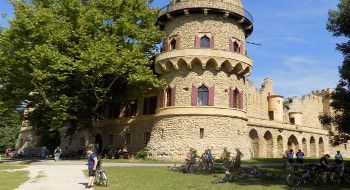 Lednice-Valtice UNESCO area which is spreading on 200 km2 over the South Moravia and the Lower Austria is ideal place for biking trips. The whole area is equipped with well mantained biking trails which enable you to visit all beautiful monuments and buildings built in the period of Liechtestein- romantic chateaux complexes in Lednice and Valtice, Johann castle, Minaret viewing tower, Colonnade, Rendez-vous temple, Border chateau, Temple of Three Graces, St Hubert Chapel and more. The landscape varying from riparian forests, vineyards, lakes and ponds and pine woods.